I asked about these rings a while ago and you requetsed a photo which I now attach. 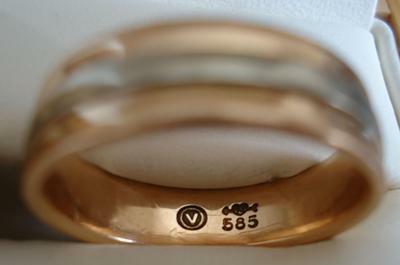 They are a pair of 14k rose gold wedding rings with a white band around the middle. The marks inside are pretty clear on the photo; a v in a circle, 585 and a heart with an arrow through it and either a Z or an N in the middle of the heart. Any info you have about thse rings would be much appreciated.